French doors installed in series, with patio doors and interior casements, light up your home like a bright pearl. 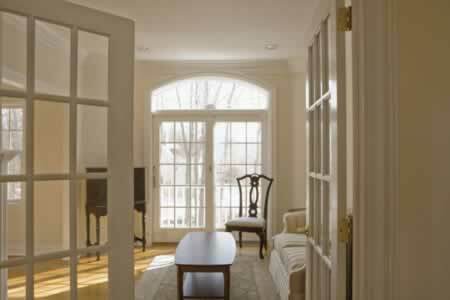 When combined with warm, off-white paint or wall coverings, French doors bring out your wooden flooring and period furniture. The exterior double French doors contain fifteen lites of glass per side in traditional style that complements colonial, revival, federal, modern, or patio homes. Patio doors can be installed with energy efficient double paned windows, along with a wide range of glazing options. The arched transom may also have protective eCoatings to block ultraviolet rays. To protect your investment, have muti-point locking systems installed in the exterior French doors. The Interior French doors separate your functional spaces without compromising the bright, open feeling of the home.